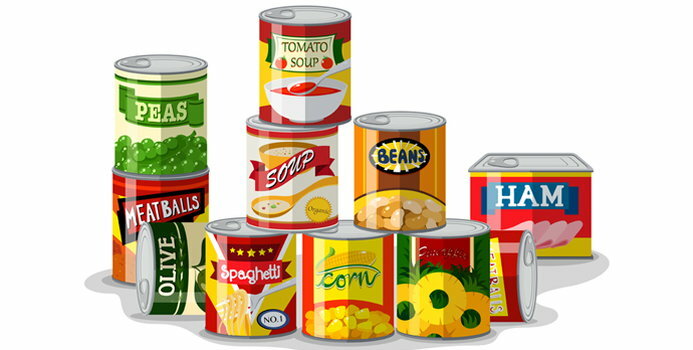 Canned food is the best option during a natural disaster (or a zombie apocalypse), and it’s great because it can preserve the food and nutrients for a long time — according to Healthline, canned food was first developed in the 18th century for soldiers and sailors. Canned fruits and vegetables are often affordable, convenient, and usually picked at the peak of their freshness, and canned within hours, which means they are filled with flavor, and often provide comparable nutrients to fresh food. But despite the obvious benefits of canned foods, there are also some cons. The process of canning foods can differ slightly, depending on what food it is, but in general, there are three main steps that take place: processing, sealing, and heating. According to critics of canned food, some products can contain trace amounts of bisphenol-A (BPA), a chemical that is used in food packaging, and a study found that over 90 percent of canned foods contained the chemical. The problem with BPA is that is has been associated with a number of health issues including heart disease and type 2 diabetes. The Telegraph notes that Breast Cancer UK has campaigned for a total ban on BPA in "food contact materials." “There is a lot of evidence, and it’s growing, that BPA can have an effect on the human body even at very low levels,” chief executive of Breast Cancer UK, Lynn Ladbrook, said. “We believe there is no safe dose of BPA..."
Another con with canned food is related to preservatives. The Alternative Daily notes can include sulfur dioxide, sodium sulfite, and potassium bisulfite, which some people can have a reaction to. Canned food, if not sealed properly, can also cause the growth of Clostridium botulinum bacteria. Cans that have been damaged and have cracks, leaks, or bulges, should be avoided because these could be signs of the bacteria that will cause botulism, EatRight reports. That said, the publication does note how botulinum in commercially packaged canned goods is “extremely rare,” although with home canning it is much more common. Botulism can cause paralysis, and if left untreated can even be fatal.